In the US, PS3's are limited to what it can access via discs or over the network, in Europe / Australia (PlayTV) and Japan (Torne) TV tuners stretch things further. Now, Sony Japan has followed those up with the Nasne headless media box shown above. A combination networked recorder and media storage device with a 500GB SATA HDD and tuners for both antenna and satellite TV built-in, it pulls in broadcasts and either records it or streams to up to two other Sony products (Vita, PS3 with Torne app, Vaio PC, Sony Tablet or Xperia phone) on the same home network at once. It will also support streaming of stored media via DLNA, once its software is updated to version 1.5. The capabilities of the Nasne vary depending on the hardware it's used with: PS3 users can connect up to four of the devices to one console, however it can also export video files formatted for offline viewing on the Vita or transfer recorded files to PCs for Blu-ray archival. Is this a promising example of the "One Sony" synergy Kaz so recently promised? The tech world will just have to wait and see. Below is a press release. TOKYO, April 17, 2012 /PRNewswire/ -- Sony Computer Entertainment Inc. (SCE) today announced that it will launch "nasne™," a new networked recorder and media storage device with built in 500GB hard disk drive (HDD) and digital terrestrial and satellite broadcast tuners. "nasne" will become available in Japan on July 19, 2012, for a recommended retail price of 16,980 yen (including tax). 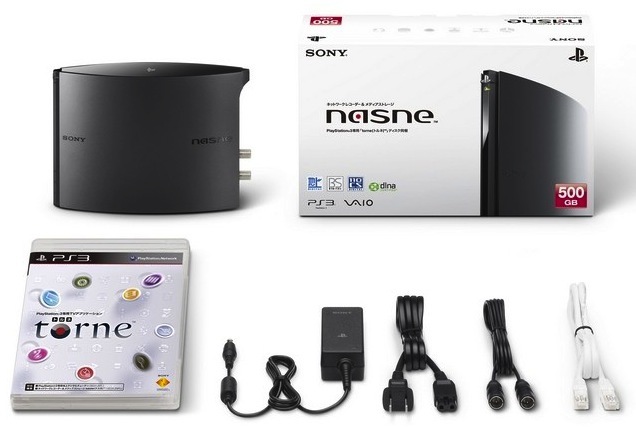 By connecting "nasne" to their home network, users will be able to watch and record digital terrestrial and satellite broadcast through dedicated applications such as "torne" for PlayStation®3 (PS3®) and "VAIO TV with nasne" for VAIO. Users will also be able to access recorded content from PlayStation®Vita (PS Vita), "Sony Tablet" and Xperia™. In addition, "nasne" will be able to stream live or recorded television programs simultaneously onto two of these supported Sony products, allowing multiple users to view the same content within the same home network. (1) "nasne" will also link with "G GUIDE TV OUKOKU CHAN-TORU", a television guide web service for PC and smart phones provided by So-net Entertainment Corporation. Through "G GUIDE TV OUKOKU CHAN-TORU", users will be able to schedule recordings of television programs on the go from their PS Vita, PC, tablet PCs, and smart phones. By connecting a maximum of four "nasne" units to their PS3, users can simultaneously record up to four television programs. Those who already have a "torne" device connected to their PS3 will be able to connect a maximum of four "nasne" units to their PS3 and record up to five television programs. (4) Details of "torne" version 4.0 for PS3 will be announced separately. VAIO PC users will be able to watch and record digital terrestrial and satellite broadcasts through "VAIO TV with nasne" (beta version)(5), a dedicated application for accessing "nasne" from anywhere within the same home network via Wi-Fi connection or LAN cable. "VAIO TV with nasne" (beta version) will become available concurrently with the release of "nasne." "VAIO TV with nasne" will become available for Windows 7 equipped VAIO PCs (6) through "VAIO Update," an automatic free update service for VAIO PC users. Sony Tablet(7) / Xperia(8) users will be able to watch and record digital terrestrial and satellite broadcasts through dedicated applications for Sony Tablet / Xperia for accessing "nasne" from within the same home network via Wi-Fi connection. Users will be also able to schedule recordings of television programs through "G GUIDE TV OUKOKU CHAN-TORU." Recognized as the global leader and company responsible for the progression of consumer-based computer entertainment, Sony Computer Entertainment Inc. (SCEI) manufactures, distributes, develop and markets the PlayStation®2 (PS2®) computer entertainment system, the PSP® (PlayStation®Portable) handheld entertainment system, the PlayStation®3 (PS3®) computer entertainment system and the PlayStation®Vita (PS Vita) portable entertainment system. SCEI has revolutionized home entertainment since they launched PlayStation in 1994. PS2® further enhances the PlayStation legacy as the core of home networked entertainment. PSP® is a handheld entertainment system that allows users to enjoy 3D games with high-quality full-motion video and high-fidelity stereo audio. PS3® is an advanced computer system, incorporating the powerful Cell Broadband Engine and RSX processors. PS Vita is an ultimate portable entertainment system that offers a revolutionary combination of rich gaming and social connectivity within a real world context. SCEI also delivers the PlayStation® experience to open operating systems through PlayStation®Suite, a cross platform and cross device initiative. Headquartered in Tokyo, Japan, SCEI, along with its affiliated companies, Sony Computer Entertainment America LLC., and Sony Computer Entertainment Europe Ltd., and its division companies, Sony Computer Entertainment Japan and Sony Computer Entertainment Asia develops, publishes, markets and distributes hardware and software, and manages the third party licensing programs for these platforms in the respective markets worldwide. "PlayStation" and "PS3" are registered trademarks of Sony Computer Entertainment Inc.
"nasne" and "torne" is a trademark of Sony Computer Entertainment Inc.
VAIO and "Sony Tablet" are either registered trademarks or trademarks of Sony Corporation. "Xperia" is a registered trademark or a trademark of Sony Mobile Communications AB. "nasne" will stream two recorded television programs through DTCP/IP simultaneously. As media storage devices, "nasne" will be able to share stored content with up to 63 connecting devices. DLNA Functionality will become available by installing the system software update of "nasne" version 1.50. To enjoy satellite broadcasting, users will need to install a satellite broadcasting antenna or establish an equal environment. Up to four satellite broadcasting can be simultaneously recorded. VAIO TV with nasne" Beta version will become available at the release timing, and no support will be available. Details of supporting models will be announced in due course. For Sony Tablet, "RECOPLA" provided by Sony Corporation will need to be installed on the device. "RECOPLA" will become available through "Select App" icon on "Sony Table" or Google Play Store for free download. Sony Table system software as well as "Media players" supporting "RECOPLA" will need to be updated. Some models of "Xperia" will support "nasne" within this calendar year. Details will be announced on the Sony Mobile Communications AB web site in due course.